It’s Party Time in Picture Butte, as the town and nearby Coyote Flats Pioneer Village prepare to kick off Jamboree Days/Harvest Days this weekend. The theme of this year’s Jamboree Days is Volunteers Get Things Done. The theme was chosen to honour the town’s volunteers, and Robert Brander, secretary for the Picture Butte Ag Society, said that 2018 was the National Year of the Volunteer. “It’s a good way to celebrate all of the different businesses in town and to remember volunteers — that’s the theme of this year’s Jamboree Days; Volunteers get things done,” said Brander. Jamboree Days events officially kicks off on Thursday, Aug. 16, with the start of the annual slo-pitch tournament, which will go all weekend. Bench Fair entries should be brought to Picture Butte High School that day between 5-9 p.m. Bench Fair entries can also be brought to the high school to next morning, between 9 a.m. and noon. Friday, Aug. 17, will see the start of Harvest Days celebrations, with a Tractor Pull going at 6 p.m.
Jamboree Days events continue with a ribbon cutting ceremony for a new dog park at the Harry Watson Memorial Park at 1 p.m., a Family Street Dance from 7:30-9:45 p.m. downtown, and a 10 p.m. fireworks display in Harry Watson Memorial Park. Judges will start looking over business windows and displays at 10 a.m., and bench fair entire will be critiqued at 1 p.m.
Saturday, Aug. 18, promises to be the most packed day for both events. 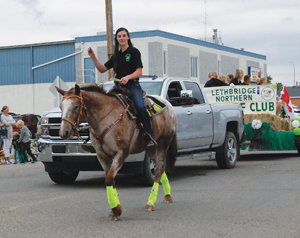 “It will start with the parade, and then after the parade there will be activities in Lions Park for families,” said Robert Brander, secretary for the Picture Butte Ag society. “As well as at the tractor club (Coyote Flats), they will be having their Parade of Power — which is their own version of the parade with all own antique equipment, that will just be on their property. Saturday’s Jamboree Days event start off bright and early, with the Lion’s Pancake Breakfast in the arena starting at 7 a.m. Bench Fair exhibits will be open for viewing at the high school from 9 a.m.-3 p.m.
Those entering floats in the parade should start lining up at the Dorthy Dalgliesh School grounds at 9 a.m., with judging starting at 10 a.m. The parade will begin at 11 a.m., and drivers are reminder that there is no parking on Highway Ave between 2nd and 4th street until after the parade is over. The parade route will be the same as last year. Activities for Family Fun Day in the Lions Park will run from 11:30 a.m.-2:30 p.m., organized by the Picture Butte Evangelical Mennonite Church. The Picture Butte Fire Department will host a slip n’ slide at the Elks Coulee Hill from 1-4 p.m. The day will finish off with a movie in Lions Park at 9 p.m., with attendees being asked to bring their own lawn chairs and blankets. Harvest Days activities will begin at noon with the site opening and offering lunch. The Parade of Power will go at 1 p.m., followed by binding, threshing and stooking demonstrations at 2 p.m. At tractor pull and kids games will go from 3-5:30 p.m.
Jamboree Days festivities wrap up on Sunday, Aug. 19, with an 11 a.m. church service in the Lion’s Park, with a free lunch to follow, sponsored by the Iron Springs Christian Reformed Church. Attendees are asked to bring their own lawn chairs. Harvest Days activities on Sunday start at 9 a.m. with a $5 breakfast. Lunch will be offered at noon, followed by a Horse pull at 12:30 p.m., the Parade of Power at 2:30 p.m. and binding, threshing and stooking demonstrations from 3:30-5 p.m.